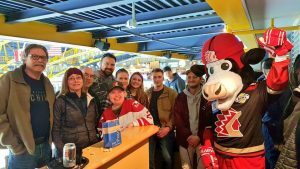 Book your next group social event in the Chiefs’ new party deck area, The Jolly Miller Pub Captain’s Corner, right up close to the action at ice-level. Tables and seating for 25 people. Food and beverage service available. 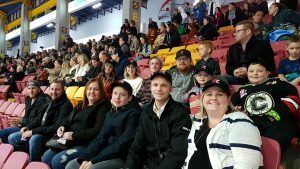 Suites at Prospera Centre offer fans the chance to experience the excitement of a game, while also providing the comfort of a private setting with well-appointed amenities. Suites are a terrific place to entertain clients and business partners, reward employees, and host holiday parties and other gatherings. Suite rentals include 14 game tickets, 2 VIP parking passes, theatre-style seating, close-circuit TV, and access to an extensive food and beverage menu. Entertain clients, build customer relationships and reward and motivate employees. Utilize all of Prospera Centre’s finest amenities with the premium seating you need to engage with those most important to your business. 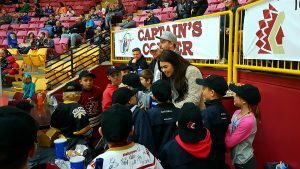 Booking a group experience may include a visit from the coach, player(s), and/or mascot, complimentary Chiefs hats, and a group welcome on the videotron and over the PA.
Book your next Chiefs group experience today!